Seyedalhosseini, Seyed Moslem. (1395). Population Growth and the Interaction of Urban Environmental Challenges, Case Study: Zahedan. معماری و شهرسازی آرمان شهر, 9(16), 169-180. Seyed Moslem Seyedalhosseini. "Population Growth and the Interaction of Urban Environmental Challenges, Case Study: Zahedan". معماری و شهرسازی آرمان شهر, 9, 16, 1395, 169-180. Seyedalhosseini, Seyed Moslem. (1395). 'Population Growth and the Interaction of Urban Environmental Challenges, Case Study: Zahedan', معماری و شهرسازی آرمان شهر, 9(16), pp. 169-180. Seyedalhosseini, Seyed Moslem. Population Growth and the Interaction of Urban Environmental Challenges, Case Study: Zahedan. معماری و شهرسازی آرمان شهر, 1395; 9(16): 169-180. Assistant Professor, Department of Urban Planning and Urban Design, Mashhad Branch, Islamic Azad University, Mashhad, Iran. During the recent decades, urban management in Iran has increasingly confronted numerous challenges due to different kinds of social, cultural, political, executive, financial, and legal factors. The present study is going to specify and analyze the aforementioned challenges in the domain of the urban environment in order to determine how far they have been effective, how they have been prioritized, and what strategies or solutions are needed to meet or reduce them. Zahedan is among those cities of Iran that due to its uncontrolled growth in terms of its framework and population, has exposed urban management to many challenges during the last two or three decades, specially, in the domain of the environment. The present study aims to investigate and analyze the effects of challenges, resulted from population growth, on the environment of Zahedan. This research’s method is descriptive-analytical and the gathered data and information have been statistically processed and analyzed using SPSS software. The results indicate that the greatest challenge in the domain of the environment is related to «water resources». Considering the population growth, human, soil, and air resources are respectively other problems which can lead to further significant problems in urban management system. Athari, K. (2000). To the Efficiency of Government Intervention in Urban Land Market, Quarterly Journal of Housing Economy, Issue Number 30, National Land and Housing Organization. Butterworth, J., Ducrot, R., Faysse, N., Janakarajan, S. (Eds.). (2007). Peri-urban Water Conflicts: Supporting Dialogue and Negotiation. IRC International Water and Sanitation Centre, Technical Paper Series; 50, 128, Delft, the Netherlands. City and Home Consulting Engineers. (2010). The Final Revision of Zahedan’s Detailed Plan, Department of Housing and Urban Development of Sistan and Baluchestan Province. Civil Deputy of Interior Ministry Planning Office, (2010). Coombes, P., Argue, J., Kuczera, G. (1999). Figtree Place: A Case Study in Water Sensitive Urban Development, Urban Water, 335-343. DavoudPour, Z., Dariyoush, A. (2008). Comparative Study of the Effective Factors in Developing Big and Intermediate Cities, Hoviyate Shahr, 2(3). Douglas, I. (2006). Peri-urban Ecosystems and Societies: Transitional Zones and Contrasting Values. In: McGregor, D.
Gharakhloo, M., Zangane Shahraki, S. (2009). 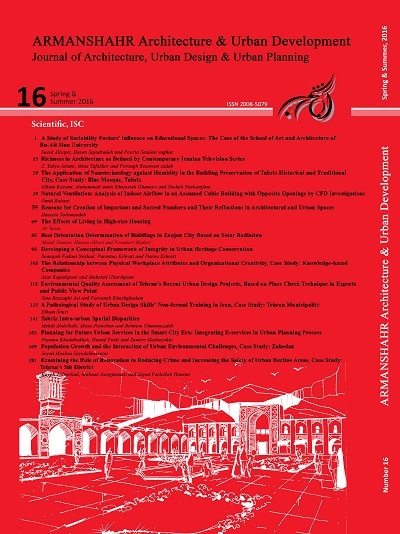 Recognizing the Pattern of Urban Physical-Spatial Growth Using Quantitative Models (Case Study: Tehran City), Geography and Environmental Planning Magazine, 34(2), 19-40. Kazmi, A. A., Bhatia, A., Shaida, A., Sharma, M., Starkl, M., Trivedi, R.C. (2013). A short screening study on water quality of Indian rivers and lakes. Indian Water Resour. Marshall, F., Waldman, L., MacGregor, H., Mehta, L., Randhawa, P. (2009). On the Edge of Sustainability: Perspectives on Peri-urban Dynamics. STEPS Working Paper 35. STEPS Centre, Brighton. Moezzi, H. et al. (2011). Separation and Preparation of Urban Lands, a Challenge in Instability of Municipalities’ Revenues (case study: Shahin Shahr), First Conference on Urban Economy of Iran. Nichol, J., Wong, M. (2005). Modeling Urban Environmental Quality in a Tropical City, Land Scape and Urban Planning, 73, 49-58. Peter-Varbanets, M., Zurbru gg, C., Swartz, C., Pronk, W. (2009). Decentralized Systems for Potable Water and the Potential of Membrane Technology. Water Res. 43, 245e265. Recycle and Transformation Organization of the Munacipality of Zahedan (2009). The Project of Temporary Displacement of Current Landfills. Housing. (2011). Sistan and Baluchestan Province. Torres, H.G., (2011). Environmental Implications of Peri-urban Sprawl and the Urbanization of Secondary Cities in Latin America. IDB Publications No 35819. Inter-American Development Bank, Washington. Impacts of Urban Development, Accounting Forum, 33, 209-224.